. Stop the world, I want to get off. Home Media Sermons by Pastor Nicki Coertze Non-series Sermons . Stop the world, I want to get off. “Cameroon troops killed around 100 Boko Haram Islamist fighters from Nigeria, freed almost 900 hostages and seized Islamic State (IS) flags last week, the defence ministry said on Wednesday.” “Tashfeen Malik and her husband, Syed Rizwan Farook, burst into a holiday party for the environmental health department in San Bernardino. After spraying Farook's co-workers with bullets, they took police on a manhunt that paralyzed the city. The couple died in a shootout with authorities the same day. "We pray to God to accept them as martyrs," al-Bayan Radio reported. This was in response to the 14 people killed and 21 injured in California this last week. These simply follow short on the heels of the Paris attacks that left 129 dead and many wounded. Then we have the ongoing saga in Syria and the Middle East with ISIS. I can spend a long time this morning giving you newspaper quotes from around the world, and to this we can add article after article of problems that we experience at home in South Africa. The world has gone mad and we have a problem. I am not going to add to the list as I do not want to depress you, but want you to leave on a positive note. So what are these handles? Handle 1. God loves us. "13 But we ought always to give thanks to God for you, brothers beloved by the Lord." In other words the first truth in the message of hope is the active, powerful, and pursuing, saving love of God, that we have now seen over many weeks that tracks us down in our rebellion until we collapse and then awakens us as new people in Christ. That is the Father drawing us. To know that you are distinguishingly, particularly, personally, effectually, irresistibly, unbreakably, and eternally loved by God is the central truth in the message of hope. So Paul says, hold on to it, hang on for dear life and stand firm. And this love knows no end. Handle 2. God chose us. “13 But we ought always to give thanks to God for you, brothers beloved by the Lord, because God chose you." It is a message of hope. Hold it firm, hang on for dear life and stand fast. Handle 3. God saved us. Notice here that salvation is something future here, not past. The way you know this is by noticing the next phrase -- they were chosen to be saved "through sanctification by the Spirit and belief in the truth. . ." Sanctification is the lifelong process of becoming holy. We are holy but if we are saved through sanctification then salvation in this verse is something that we are looking forward to, not something that has already happened. And what is it? Verse 14 makes that plain: “To this he called you through our gospel, so that you may obtain the glory of our Lord Jesus Christ.” So this is a process. I know I am saved in faith, but I will only really know that I am saved if I endure and grow in my sanctification. The message of hope here is that we are destined for glory. Look at how Paul says it in Romans 8:30 "Those whom he predestined he also called, and those whom he called he also justified, and those whom he justified he also glorified." Whatever afflictions and sorrows you must endure in this life, don't ever let go of the truth in the message of hope that God's elect will be saved – the glorified will be glorified, and the sufferings of this time are not worth comparing with the glory to be revealed to us in the coming of the Son of Man. Hold it fast, hang on for dear life and stand firm. Handle 4. God sanctifies us by the Spirit. “13 But we ought always to give thanks to God for you, brothers beloved by the Lord, because God chose you as the firstfruits to be saved, through sanctification by the Spirit and belief in the truth." There is holiness, a measure of sanctification, without which we will not be saved. We are not sanctified AND saved; we are saved "through sanctification". So the issue while important, is not now, but the end and the process by which we arrive at the end. This is not an exaltation of works in which we could ever boast. It is an exaltation of the Holy Spirit. It is sanctification by the Spirit." God's Spirit, the Holy Spirit. This is why it is one of the truths in the message of hope we hold onto. It is a work of God -- just like every thing else: God loves, God chooses, God saves, and God, the Holy Spirit, sanctifies and brings us to glory. Handle 5. God keeps us in the truth. And what is our part? The next phrase tells us: “13 But we ought always to give thanks to God for you, brothers beloved by the Lord, because God chose you as the first fruits to be saved, through sanctification by the Spirit and belief in the truth." And what is this belief in the truth? It is none other than clinging to the message of hope for dear life. It is a desperate clinging to the truth as you know that your life depends on it. This is why sanctification by the Spirit and faith in the truth are not distinct acts. It is not as though our faith in the truth and the Spirit's sanctifying work run in separate parallel tracks and have nothing to do with each other. No. Saving faith, with all its impulse to love the truth is the power that the Spirit uses to make us holy. When, by faith you take hold of God's truth, and you love it because it's your only hope in the world. That faith is the power of God's Spirit for everything you live for. The Word of God becomes my final rule for faith and conduct. Can you identify with the church of Thessalonica today? In verse 14 there is the message of hope that is linked to the receiving of the gospel: "To this he called you through our gospel. . ."
Something that is so beautiful is that from all eternity God loved the church at Thessalonica. He chose them before the foundation of the earth from all the sinners in Macedonia. He sent Paul to them with the gospel of the good news that Jesus Christ came into the world to die for hopeless sinners. And in the preaching of that gospel God called his elect with overcoming power to himself. And the result was that they believed the truth and began to be sanctified by the Spirit, and will one day obtain the glory of our Lord Jesus Christ. Here is the good news. If you are a born again believer here today you are among them. If you are not a born again believer, you can be among them. I hold out to you this morning the message of God's gracious truth. And I pray that God himself will call you. And through this Word this morning by His Spirit, He is stirring up each and every one of us to take the handles of hope, which are seen in God’s love, God’s election, our sanctification by His Spirit, and the keeping of us in His truth as revealed in the Word of God. We simply need to look beyond the troubles in the world, and hold on to it to the extent that nobody could pull us away from the firm grip with which we hold onto these truths. 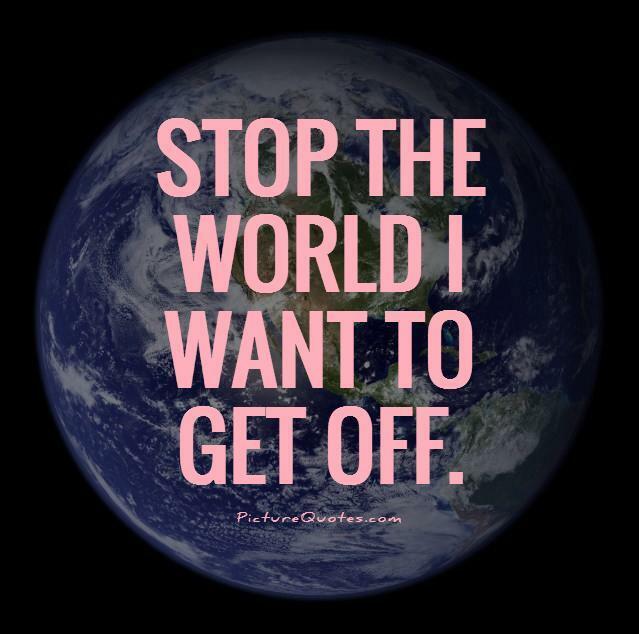 So instead of saying: “stop the world I want to get off”, hold on to these 5 handles and enjoy the ride. I plead with you this morning. Take it. Hang in there, hold it fast. It cannot break! We can because we are part of the body of Christ, and these truths apply to us.